Today I had my nephew over for a bit. 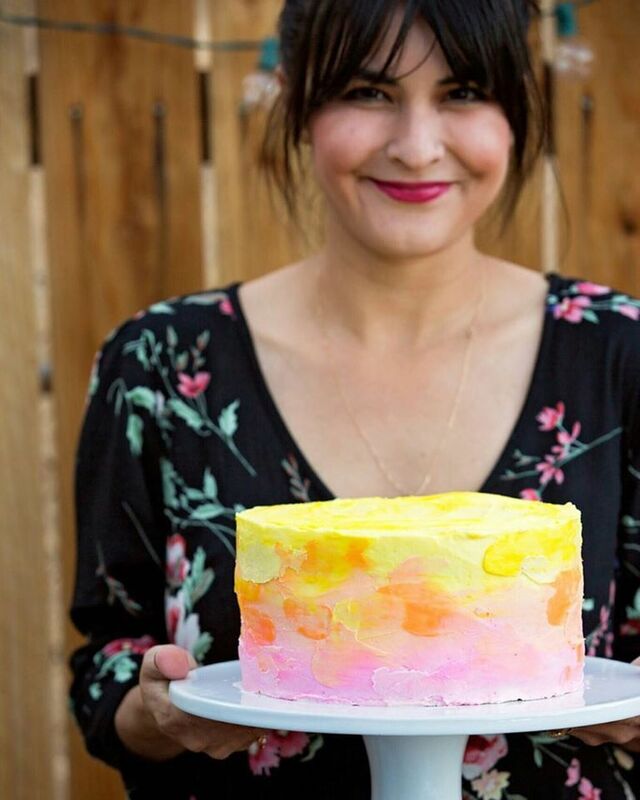 He always request to bake with me, but I usually have something in my pantry for us to make. So I knew he would be coming over, and would ask if he could help me make something in the kitchen as usual. So before he came over, I bought stuff to make Lucky Charm krispy treats. I've been meaning to try this, and it's a kid friendly. 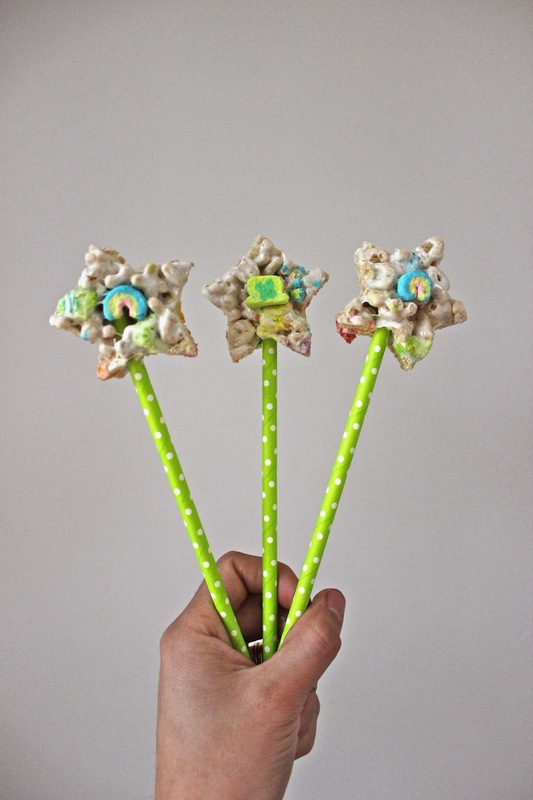 It's basically like a rice krispy treat, but take the rice krispy and substitute it for some good ol' Lucky Charms! Many people have done this so it's not my original idea, and the people at Lucky Charms sell this now individually packaged. 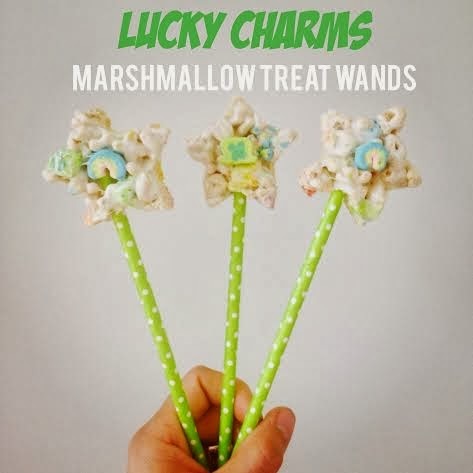 But I decided with St. Patrick's Day around the corner, I would make these treats magical, and make them into marshmallow wands. First, you want to follow the rice krispy treats recipe. I'm guessing most of you have made these. But if not, just click on the link and it's super simple. Also, most marshmallow bags have the recipe on them too. But the one change we will be making is substituting it for Lucky Charms cereal. Once you've followed the recipe and done with your marshmallow gooeyness, and have placed it in a 13x9 pan, make sure you flatten it with a spatula. P.S. I also had extra cereal so I took out the Lucky Charm marshmallows and added extra shapes on top. Once the marshmallow mix has cooled, you can start cutting you your stars. I picked areas where I added the extra marshmallow shapes. And you need a tiny bit of force cutting these. And here's the star. Once you have the shape, poke the bottom of the star with a paper straw. These straws are great because they usually come in fun designs, and are ready sturdy. And just let them sit in the fridge for about an hour to make sure they harden a bit to their form, and stay onto the stick. And you're done! These are fun, and yummy! And let me just tell ya, my nephew loved them! Mostly, because he helped with the making of them! And I loved them because no sticky fingers!